"There's a time to be born and a time to die. A time to plant and a time to harvest." In the last year, I've watched FaceBook degenerate into a partisan political place where friends and family turn upon one another like crazed badgers. I have to admit that I've been just as guilty as others who post nasty memes and try to demean those who don't agree with me. There's nothing wrong with writing about politics, but there is a time and place for everything. FaceBook was not meant to be a political room where people can romp around and spout hateful partisan slogans. FaceBook was meant to be a way to positively connect with people. Family and friends. I've discovered, and re-connected, with a lot of people since I joined. 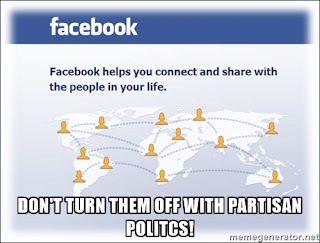 I will no longer post partisan crap on FaceBook. I'll keep my political dialogue in my blog where it belongs. It's a great outlet for taking on politics in general. 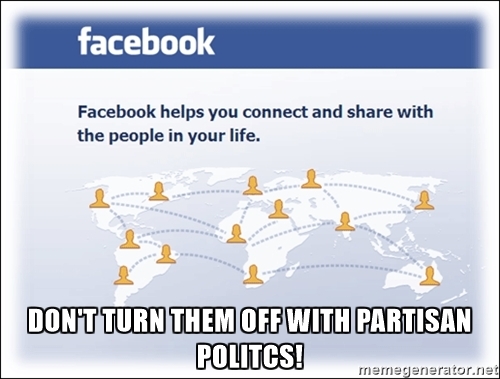 I hope that others who see themselves going down that same political path I was on in FaceBook will pause, and reconsider. There's enough polarity in our society today. Let's make FaceBook a safe - and fun - place to be again.